The Fremantle Roosters U14 boys team were crowned premiers this year. THE Fremantle Roosters Junior Rugby League club are looking for new players eager to join a sport that is fun, inclusive and fast-paced. Based at Ken Allen Field, the club is inviting children aged four to 16 to join their list of 250 members in the growing junior program. Fremantle Roosters junior committee member James Bunce said the sport was booming in the state. “Rugby league is a fantastic way for both kids and parents to meet new friends get fit and be part of a growing community here in WA,” he said. 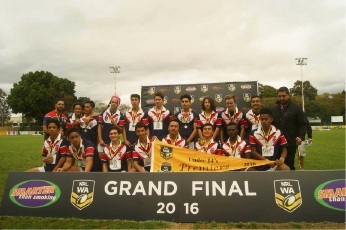 “With two NRL fixtures and two rugby league world cup fixtures already planned for 2017 and a huge coup to get State of Origin here in 2019, there’s no better time to start learning the game and becoming involved in the WA Rugby league family. The 2017 season will run from April to October. Email juniors@freoroosters.com .au or visit www.facebook.com/FremantleRoostersJuniorRugbyLeague for more information.